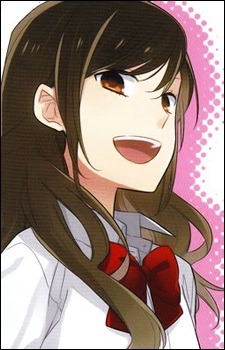 Hori has a slim figure and has long brown hair. When she is out of school, she dresses casually and ties her hair up in a bun. Hori is a very energetic person. She is popular and always creates a happy atmosphere around herself. She is a very hardworking person, and even though she has chores around her house to do, she does well in school and scores over 90 in exams. Her parents are always busy, so in order to take care of her brother, she has to return straight home after school every day and take care of the house. She's the kind of girl who does not want to show to others her vulnerable side. So sometimes she just does not express her feelings and suffers alone. She thinks of Miyamura as a very good friend, always helping her and going over to her house to help take care of her brother Sota.